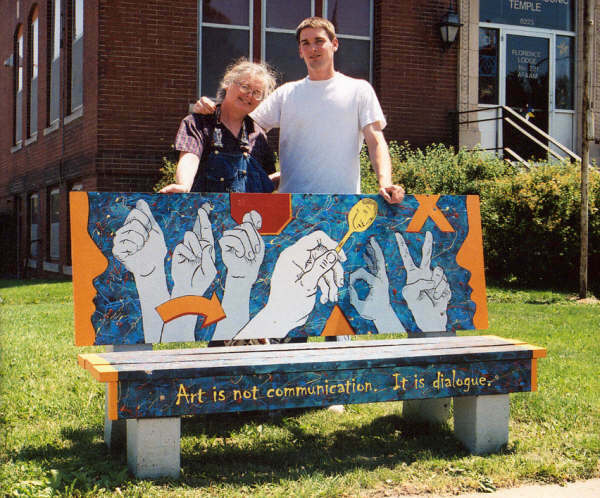 This bench was created as part of Omaha's 2005 Benchmarks Public Arts Project. It was painted by Linda and Doug Meigs in memory of their late son and twin brother, Connor Meigs. It incorporates Connor's sketchbook quote, "Art is not communication. It is dialogue." The image includes Connor's sketches of hands, his graffiti-tag-name and Linda Meigs' sketches of sign language spelling ART. The background is painted in the manner of one of Connor's large paintings as a tribute to him. This artbench was sponsored by the Florence Kiwanis Club.